The state budget may still be out of whack, but the NY did manage to pass a moratorium on using high volume hydraulic fracturing in yesterday’s session. And fracking wasn’t even on the Governor’s “to do” list for the special session. Still, the Assembly wanted to vote on the bill, so they gaveled in for a regular session, and began debating the fracking moratorium close to 9 pm last night. Before the clock struck midnight, the’d approved a temporary moratorium on fracking with a 93 to 43 vote. The moratorium halts fracking until May 15 to allow the state time to obtain a more complete picture of environmental impacts from the technology. This is the same bill that the NY Senate approved in August. Now the bill is on Governor Paterson’s desk awaiting his signature. Will he sign it? Susan Arbetter will ask him this morning on The Capitol Pressroom which airs at 11 am. 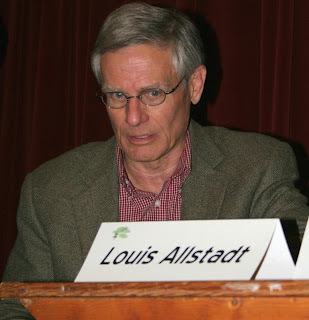 “Safe” is a relative term, says Louis Allstadt. Drilling might not ever be “safe” but it sure can be made a lot safer. A couple weeks ago Allstadt, who worked in the oil and gas industry for more than 30 years, outlined about what “safer drilling” might look like. For one thing, gas companies will have to use safer drilling fluids that are not composed of toxic chemicals and carcinogens, Allstadt said. “And there would have to be no exemptions!” Right now gas companies enjoy special exemptions from the Safe Drinking Water Act, Clean Water Act and other environmental laws. Allstadt proposed that drillers use some kind of marker – either colored fluid or an isotope – to tag their fracking fluid. “That’s one way to hold companies accountable for any leaks or spills they cause,” he said. He also stressed the importance for conducting a seismic review of the well before fracturing. This would help drillers identify cracks and fissures that might provide pathways for toxins to migrate to aquifers. “We need better casing standards,” Allstadt emphasized. 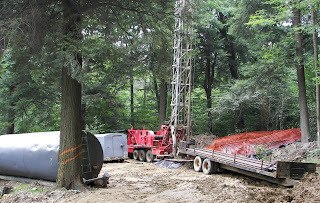 Casing integrity is vital to protecting groundwater from drilling contamination – something the Pennsylvania Dept. of Environmental Protection has noted in their newest regulations. In addition to improving the quality of cement, Allstadt pointed out that drillers must check the casings prior to fracking. “If there is any question about cement integrity, then don’t frack,” Allstadt said. Drillers need contingency plans, too. Allstadt noted that at a recent blow-out in PA, the blow-out preventer didn’t work. Whether it is drilling a relief well or flaring gas, workers need to have a strategy in place for releasing pressure if it builds up too high, he said. In addition to recommending tanks to hold fracking and flowback fluids (rather than pits) and better treatment of returned drilling fluids, including re-use, Allstadt pointed out the need for greater setbacks. Allstadt doesn’t believe drilling can be made as safe as airline travel – there’s just too little regulatory oversight for that, he says – he believes the industry can make it safer. But that will only happen if people push much harder for protective regulations. Allstadt spoke at the “Real Impacts of Gas Drilling” forum held Tuesday, November 16 at Trinity Episcopal Church in Elmira. The forum was organized by People for a Healthy Environment, the Coalition to Protect New York, the Committee to Preserve the Finger Lakes, and Pax Christi Upstate New York. Is "Recycling Waste Fluids" Just Another Name for Disposal? Three weeks ago I posted a brief review on how Range Resources is re-using flowback and frack waste fluids in their drilling process. The idea sounds great: re-use, recycle and reduce the need for pumping millions of gallons of water from our streams and rivers. But while industry engineers rave about the technology, some people living near recycling operations aren’t so ecstatic. Since that post, I heard from one woman living in the Barnett Shale play who described a local recycling facility. Fountain Quail, a partner in the Williamsport Eureka facility (which is the one Range currently uses to clarify their frack fluids) operates a similar facility located in the midst of drilling sites just north of the Dallas-Fort Worth area. “It stinks,” said the Texas resident. She described the odor as an offensive mix of diesel and chemicals that smells like stagnant water. The idea of using well-site recycling might work in isolated, rural areas she said, but the odors are evident from as far away as 1,000 feet. “You wouldn’t want to live nearby,” she said. Already many people have raised concerns about the cumulative impact of emissions from compressors and other facilities; we should add recycling facilities to that list. Then there is the question of whether diluting and reusing flowback to drill wells is a legitimate use for drilling waste fluids. “Why isn’t re-injecting flowback fluids into a well regulated under UIC?” asks Dr. Anthony Ingraffea, professor of civil and environmental engineering at Cornell University. UIC refers to the Environmental Protection Agency’s Underground Injection Control program which regulates disposal of oil and gas drilling wastes in deep disposal wells. “Congress established the UIC program to protect drinking water,” Ingraffea emphasized in a recent phone conversation. Under the UIC program, drilling wastes are injected into class II disposal wells. 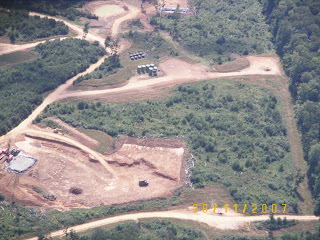 EPA regulates these class II wells, limiting the pressure and volume of waste fluid injected into disposal wells. More importantly, EPA requires the company to demonstrate that injected wastes will not come into contact with any groundwater. That means the company has to identify all abandoned wells in the area and make sure they are plugged properly – otherwise injected waste fluids may find a pathway to contaminate drinking water. So here’s the conundrum, says Ingraffea: while the EPA strictly regulates how fluids are injected into a deep disposal well, no one is regulating how those same fluids are being reused in drilling. Add recycling to the long list of things EPA needs to look at in their new hydro-fracking study. Hunters living next to the Millennium pipeline aren’t too worried about the right-of-way that cuts through the Southern Tier of New York. After all, the nearly 100-foot wide corridor cutting through the woods creates habitat that attracts deer and turkey. Hunting is big business in NY, bringing in more than $890 million in retail sales each year, says one study. Add lodging, gasoline purchases, restaurant meals and permits and you’re looking at a $1.5 billion contribution to the state’s economy. 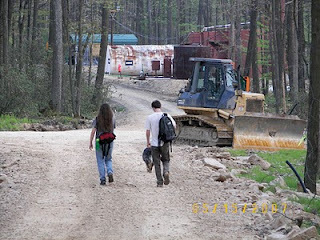 How will intensive industrial shale drilling impact NY hunting? For an answer, let’s look south of the border, to Pennsylvania. Already some PA hunters have complained that their favorite spots have been cleared for drilling pads. On Nov. 7, Penn State advised sportsmen to be alert for Marcellus activity on public land. 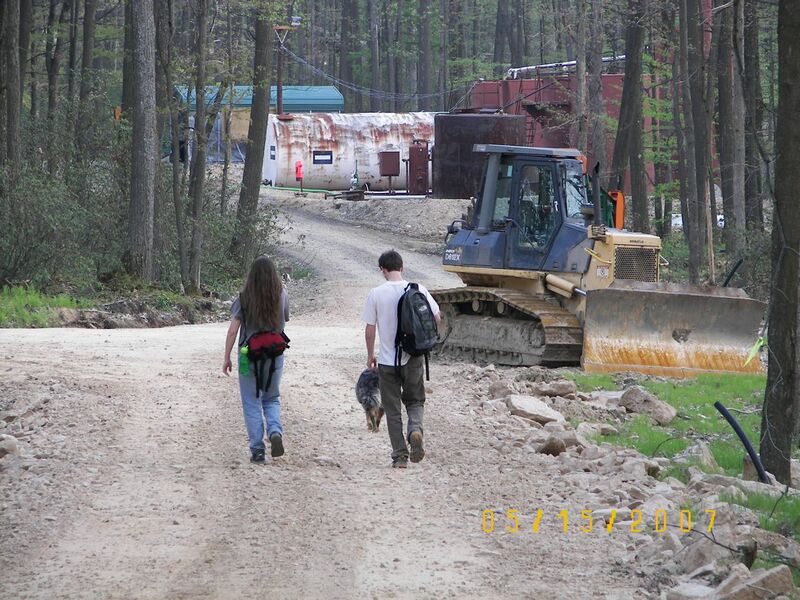 Drilling on PA state land increased from 1970 active permits in October 2009 to more than 4500 active this October. That’s more than double. One problem facing hunters: increased traffic in the forests. There could be new roads and heavy truck traffic near active drill sites. The PA Dept. of Conservation and Natural Resources (DCNR) promised to limit heavy truck traffic this weekend for bear season. Meanwhile, they urge hunters to take precautions when shooting around well sites. How will hunters know there’s drilling in the area? DCNR says they’ll post active well pads with signs 150 yards from the edge of the pad – that’s three times the setback distance from streams, if you’re keeping score. While there’s no obvious impact on white tail, some hunters wonder whether intensive drilling might cause declines in deer and game bird populations. Biologists in western states have observed population declines in deer, elk, grouse and Pronghorn. The biggest factor is the impact of roads. Deer and elk depend on large unbroken stands of spruce and fir to provide shelter from wind and cold as well as cover from predators. Roads slice forests into increasingly smaller fragments, and smaller forests means smaller populations. Well density is important: while one gas well per square mile had minimal effects on Wyoming’s mule deer populations, sixteen wells per square mile showed a significant effect. Then there’s the question of food safety. Many hunters count on their deer to stock the freezer. But how safe is venison harvested from areas where intensive industrialized drilling takes place? Some chemicals in frack fluid and drilling wastes can accumulate in tissues, but so far there has been no research on the impact of industrialized drilling on wild food. 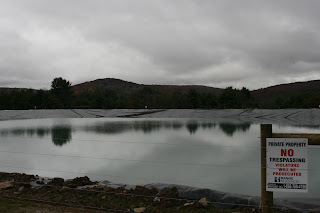 On Saturday I headed south of the border with a friend - we wanted to see some of the Marcellus effects first hand. We headed to Troy, a small, historic borough of about 1500 smack-dab in the heartland of Pennsylvania's Endless Mountains. It's a lovely old town, with a castle for a bank and wonderful brick buildings lining Main Street. Lively, too, as two separate Girl Scout troops vied for customers to purchase Thin Mints and Lemon cookies. We stopped for subs at Vinnies Pizzaria, and were lucky to find a free table. Within the first fifteen seconds of sitting down, three trucks hauling residual waste passed by. For the next twenty minutes we kept a tally of trucks heading through the center of town. We counted 36, most hauling drilling waste fluids. A few hauled fresh water and some were transporting pipe to well sites. We didn't count pick-ups; there were too many. If you grab a calculator you'll see that 36 trucks in 20 minutes is close to two trucks a minute. And they go like this all day long, said the locals who were eating lunch next to us. Two trucks a minute may not sound like a lot of traffic, but they do raise a dust cloud. And they did have a tight squeeze around the corner. The New York Department of Environmental Conservation (DEC) manages more than 785,000 acres of state forest. These are lands that are managed for multiple uses including timber harvest, recreational activities, conservation and, if the strategic plan is adopted, gas drilling. Problem is, industrialized gas drilling isn’t compatible with other forest uses. Just ask Bill Belitskus, president of the board for the Allegheny Defense Project. The most visible impact of drilling, he says, is the explosion of access roads and pipeline right-of-ways criss-crossing the forested hillsides. Drilling relies on a massive road system to bring machinery, rig parts and water to the site, and a system of pipelines for getting gas to market. Each of those road cuts and right-of-ways slices the forest into smaller and smaller fragments. 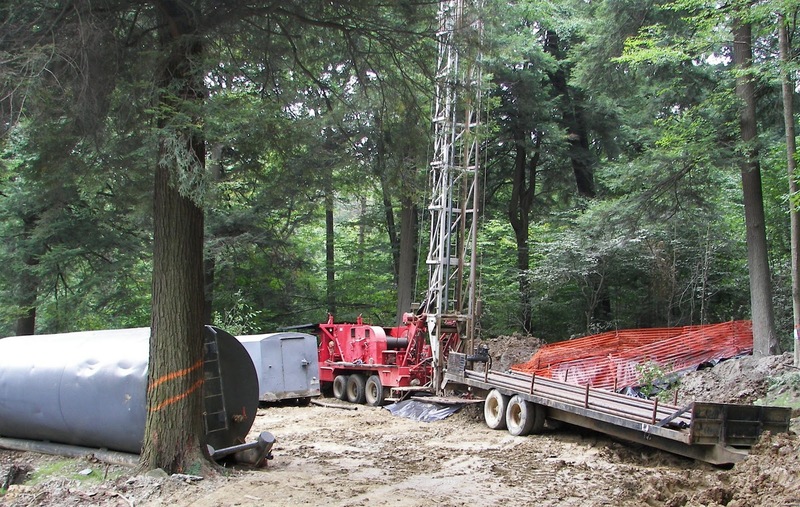 Pennsylvania’s Allegheny National Forest is home to 12,000 - 15,000 shallow gas wells, and companies are now applying for Marcellus permits. The larger pads and wider roads, built to accommodate heavier trucks, will only exacerbate the fragmentation, Belitskus said. Belitskus tallied up the acreage used by drilling at one site: 5 acres for the pad, a 10-acre fresh-water impoundment, a 1 – 2 acre frack pit and land for the access roads adds up close to 20 acres. Given the industry’s projection of 30,000 new wells in PA by 2020, he worries the disruption on the landscape will be significant and long term. “Right now they’re drilling anchor wells,” Belitskus said. This is when a company drills a single well on a unit and then packs up their gear and heads to another unit to drill a well. The strategy, Belitskus explained, is to get a hole in the ground and then hold the leases “by production” until they can get back to complete their drilling. That might take ten years, and the companies don’t have to do any remediation until they finish drilling activities. How does drilling impact other forest uses? Stormwater runoff from road and well pad construction adds sediments to trout streams. Lowered oxygen levels and increased pollutant levels can reduce fish populations and, in the case of sensitive species, kill them outright. Road and pipeline right-of-ways provide corridors for invasive species that change the character of the forests and affect timber harvest, sugaring and mast production for wildlife. Birds and other species that require large areas of continuous forested land are put at risk. And then there’s recreation. Shellie Northrup, an avid hiker and member of two trail associations, says hikers report coming across flaring wells, piles of tree trunks blocking trails, and well pads that obliterate paths. Drilling affect the aesthetics of an afternoon hike, and presents a safety hazard when sharing public lands used for recreation. Read more about Allegheny Defense Project here. You can read a longer article from the print edition of Broader View Weekly here in a couple weeks. What to do With Flowback? Just Pump it Back Downhole. It takes anywhere from 3 to 5 million gallons of water to frack a Marcellus well, water that companies are pumping from local rivers or purchasing from municipalities. But, says Dave Yoxtheimer at Penn State University, drillers are looking into alternatives: treated wastewater, cooling water from power plants, and abandoned mine drainage. They’re also exploring ways to reuse their flowback and waste fluids. A number of companies have engineered recycling technologies, including Aqua Pure and GE. But, says Tony Gaudlip, water operations manager for Range Resources, recycling flowback may be as simple as pumping it back down the hole. In an October 21 webinar Gaudlip said that Range Resources has been recycling 100 percent of their flowback for the past year. Reusing the water has resulted in a savings of $200,000 per well, about 5 percent of the total drilling cost. We’re not talking a lot of flowback – only 10 percent of what’s injected comes back out. Still, the company’s engineers needed to consider a few things before pumping wastefluid back down the hole: pumping pressure – horizontal wells require about 80 to 100 barrels of water per minute to fracture the rock; and the chemicals they used. Fracturing Marcellus requires different chemicals than shale wells in other parts of the country. “Initially we took the flowback and the brine, mixed it all together and pumped it downhole,” Gaudlip said. They watched the dials and gauges, looked at bacterial growth and scaling, and analyzed fluid stability. “We saw some increase in friction, but that was manageable,” Gaudlip said. What they didn’t see was scaling. Nor did they see an elevation of the total dissolved solids (TDS) levels. Conventional wisdom expected those levels to climb higher with each reuse. What this meant for Range Resources was that they could reuse their fluids with minimum – or no – treatment. So for the past year they’ve been diluting the flowback in a new mix that’s three-quarters fresh water combined with one-quarter reused waste fluids. flowback fluids to Eureka Resources, in Williamsport. After raising the pH, adding flocking agent to settle the solids and tossing in chlorine to control bacteria, the “clarified” waste fluid is hauled back to the well pad where it is stored until it’s reused in fracking. The idea behind reusing drilling waste fluid was two-fold: to reduce the amount of water withdrawn from the rivers and streams, and to reduce the amount of truck traffic hauling both fresh and wastewater on the road. Gaudlip admits that trucking the flowback 35 miles to the treatment facility is not an ideal situation. Not for Range and not for the local residents. Long term plans call for Range Resources to incorporate mobile water treatment units at their drilling sites. But that’s still a few months off, says Matt Pitzarella, Range Resource Public Affairs Director for the Marcellus region. 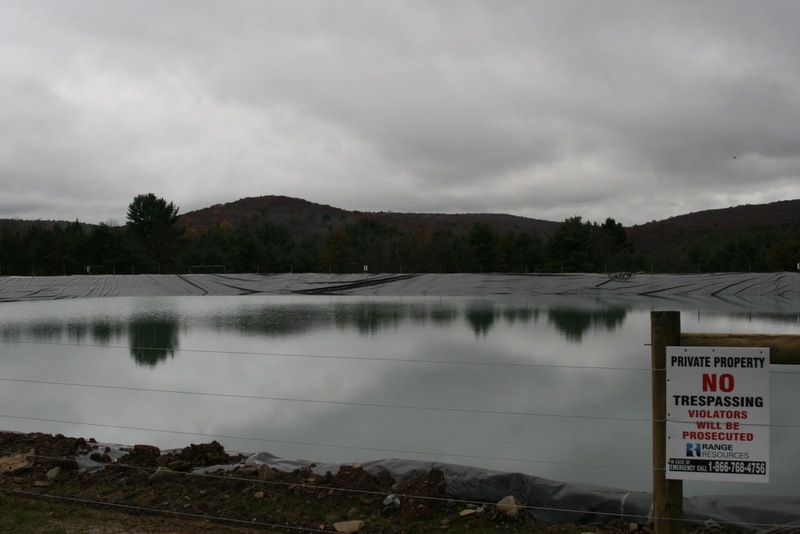 The company’s ultimate goal, he said, is to maintain zero liquid discharge in Pennsylvania’s surface waters. You can hear Gaudlip’s webinar presentation here. The longer article that was published in Broader View Weekly last week should be available here sometime next week.